How does Total Escape make money online? Total Escape receives income from a variety of sources online & off. The web site has been live for 12 full years (come OCT 2008). DanaMite's first approach was to create a 'mobile web site design' service for small lodges within California. After a 1998 direct mailing to 800 California innkeepers, I soon realized that I was ahead of my time. Most inns did not even have a web site prior to 2000. Neither did the government agencies - like the State Parks & National Forests. 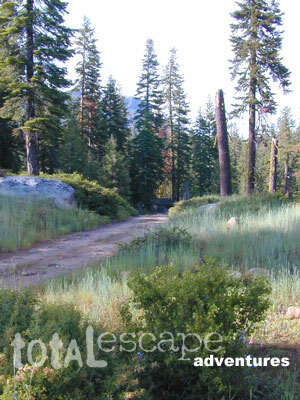 But Total Escape was there, way back when, with real California content, camping options & plenty photos. Mainly, Total Escape sells California maps to get you inspired, off the couch & outta the house. We list independent lodges & recreation businesses, so you can find out what to do & where to stay. Innkeepers can get lodges featured: standard links & photo deluxe. Amazon sells tons of great camping gear. If you buy it thru our site we get a few cents on referral commissions, which helps keep us up late night hours programming the latest outdoorsy finds for you. Zillions of real photos for you await. Perfect outdoorsy weekends away will be yours for the choosing. Total Escape also sells text ads to small businesses wishing to reach this back roads, niche California market. Hey you, get off the couch. You're gonna miss it again this year. Take a drive from the smog lands of Los Angeles this week. This is a very good show, this time, out in the high deserts of Lancaster - Hwy 138, east of Intestate 5. The California Golden Poppies are at their prime, right now! California wildflowers are in bloom, so don't wait too long, or you will miss the window of popportunity. Loving the huge spike in web traffic. From the Manson cult ranch hitting the news, to the outdoorsy people getting restless... finally finding the best camping photos of California on my Flickr page. Daily photo views went from an average of 500 to over 1000. Yippeee! Looking for beautiful California locations? Out in nature, wild & free --- away from the freeways & malls.